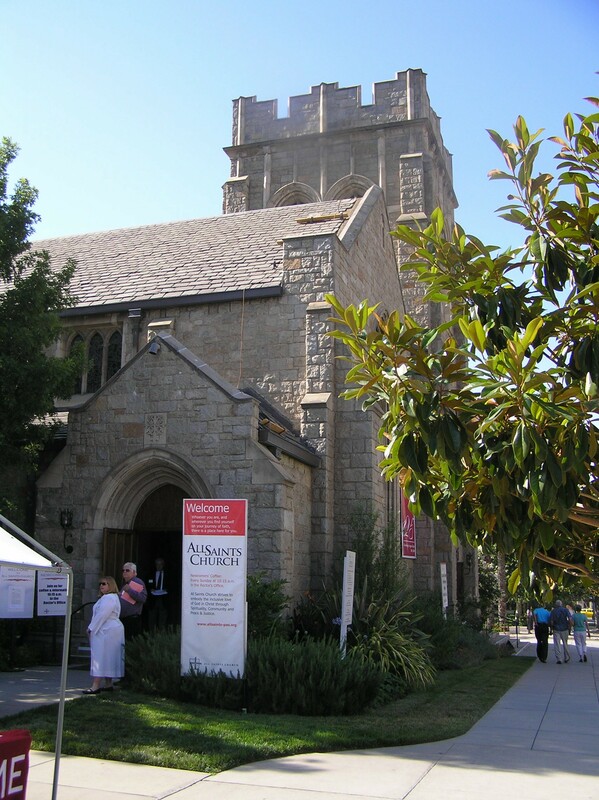 Last Sunday morning, before my husband and I piled our son’s undergraduate detritus in our van and headed home from Pasadena, I stopped into All Saints Episcopal Church for the 9 a.m. worship service. 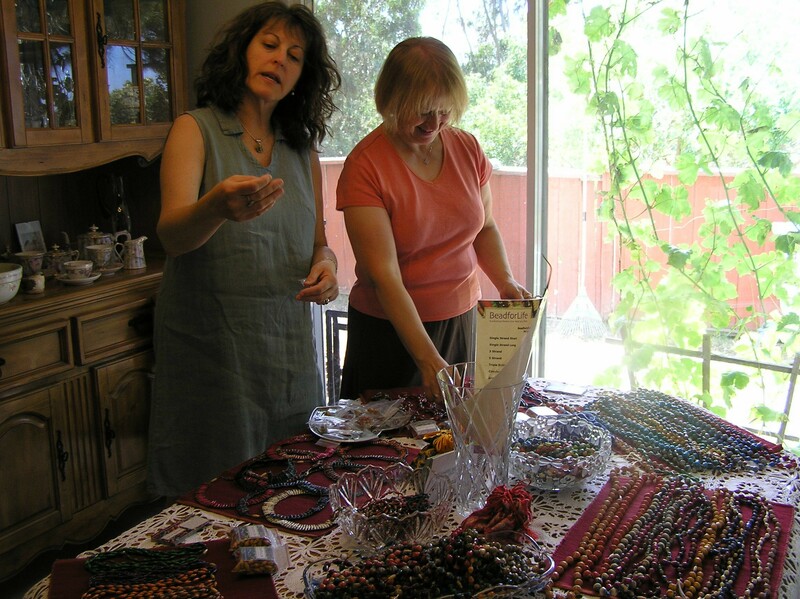 I took with me my set of Episcopal prayer beads that I made at the Sea Ranch – the ones made from paper beads made by women in Uganda. Full disclosure – I have used Rev. Susan Russell, an All Saints pastor, as a source for several stories I wrote for Beliefnet.com on the Episcopal Church’s struggle with homosexuals in the church. I have also listed her a source for other reporters to use as a source on the same subject for ReligionLink. I love this church. I have visited it before on other trips we have made to see our son. It looks like my idea of church should look. It is a traditional stone structure with the traditional nave, apse and transept layout, with the four arms of the church ending in four gorgeous stained glass windows. The appointments of the church are traditional, too, with woodcarvings that decorate the podia and stonecuts that adorn the communion rail. An elaborate wooden latticework runs across the top of the altar to separate the choir from the congregation. It is just lovely. But what pleased me even more that this church belies the commonly held notion that Sunday morning is the most segregated time in America. I am happy to tell you that I worshiped this morning with blacks, whites, Asians and Latinos. There was a lot of grey hair, yes, as in most mainline Protestant churches, but there were lots of young people, too, including a couple in the pew in front of me who came in jeans and t-shirts and fit right in. The music we sang consisted of traditional English hymns, African-American spirituals and some Spanish verses to old Christian standards. It felt like God’s home should feel like. After the sermon came communion. 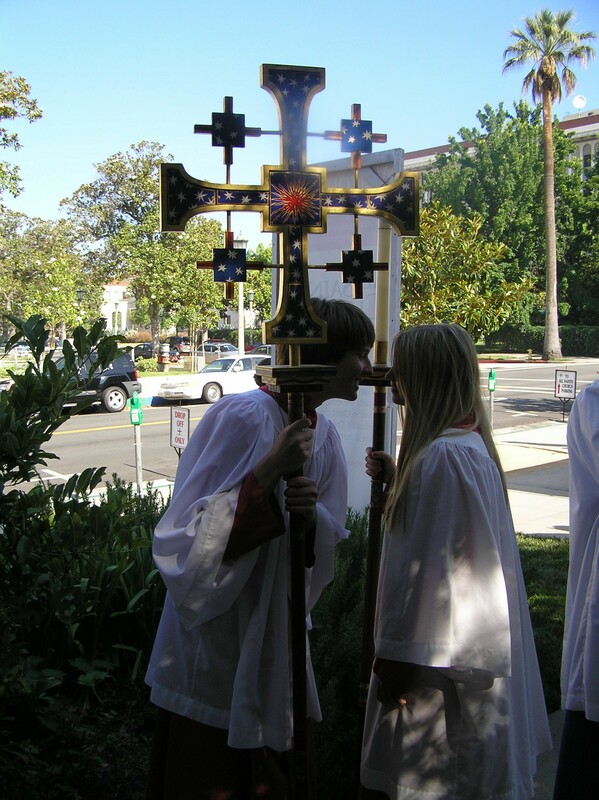 This is my favorite part of the service, the time I feel closest to the holy and the sacred. 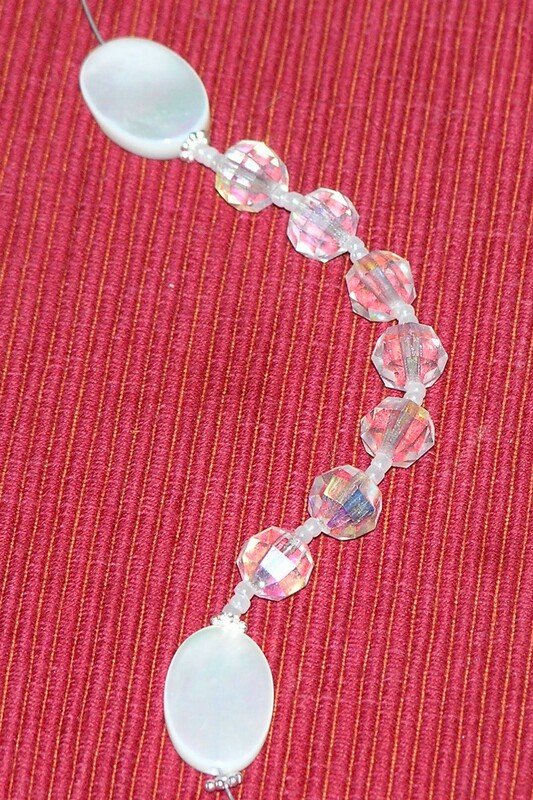 It is when I pull out my prayer beads and try to focus on aligning myself with the divine. I carry some of my favorite prayers on a laminated card in my purse, but was inspired to use instead some of the lines of the collects, liturgy and prayers printed in the bulletin given each person at the door. You can do this, too, at any worship service you attend. Just pull out the words from the service that feel most like prayer to you. 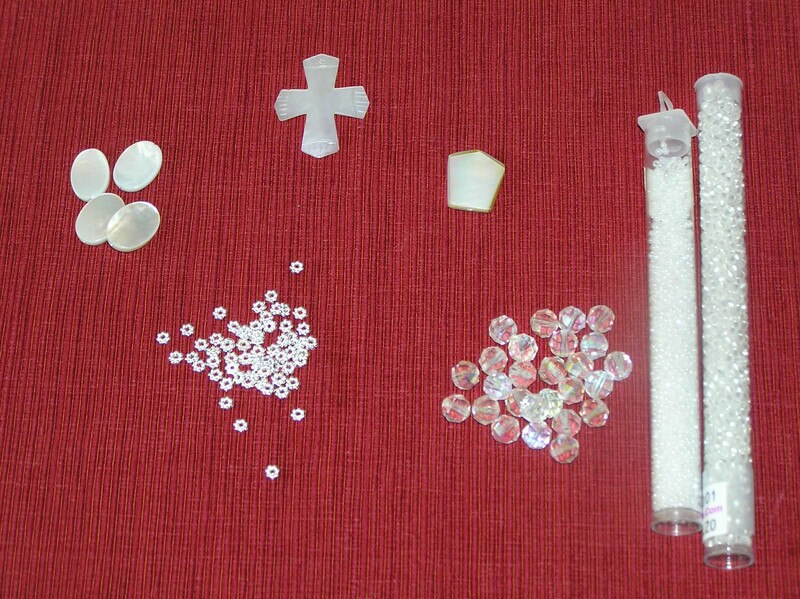 This is what I came up with for my Episcopal prayer beads, but I could have said them on a Catholic rosary, a Pearls of Life or any unique set of prayer beads I have constructed. Here goes . . . .
“Fire our imagination for the future” – I love that. That is exactly what I, as a writer, need. And to “dare great things” – safe writing is boring writing. For me, this is a powerful prayer. “Blessed be God: Creator, Redeemer and Sustainer. 10) (in the spirit of the sermon) bless me with the power to forgive and to be forgiven. I don’t when I will be back in Pasadena – if ever – but I will certainly make a run to All Saints. 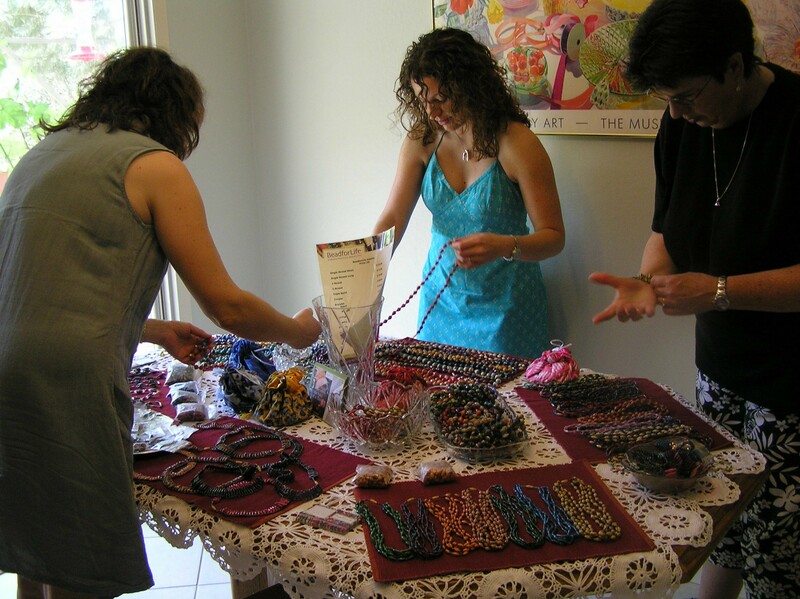 Its spirit of inclusion and joy and purpose infused me with a brightness that I still feel. 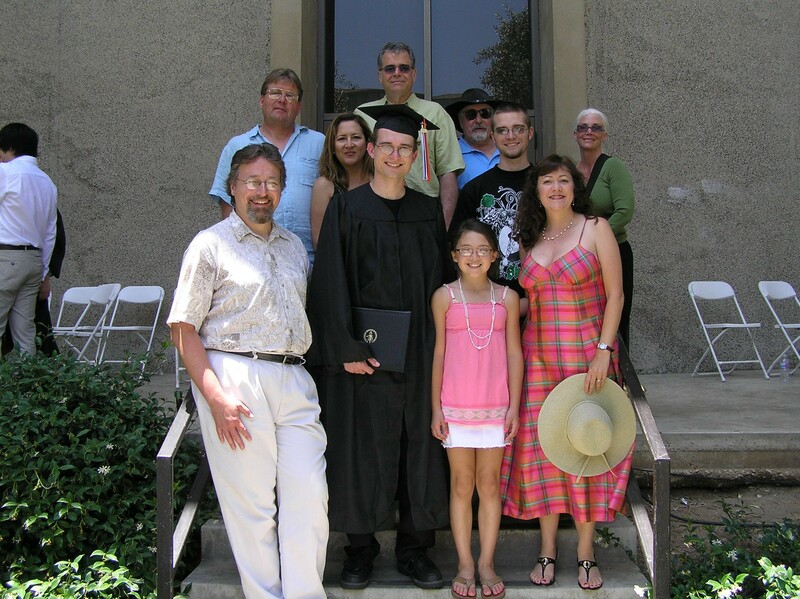 This is the last post I will write on my son’s Shawn’s graduation. 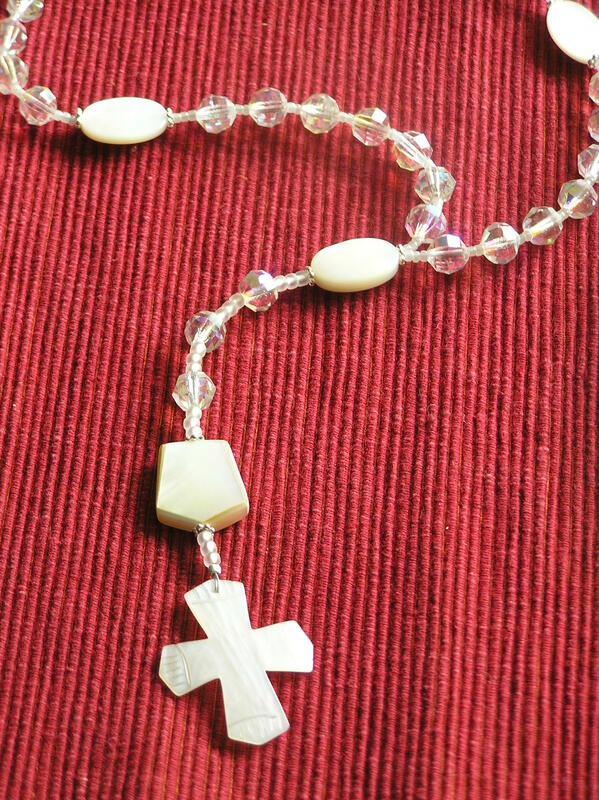 It has NOTHING TO DO WITH PRAYER BEADS, but is for my friends and family. 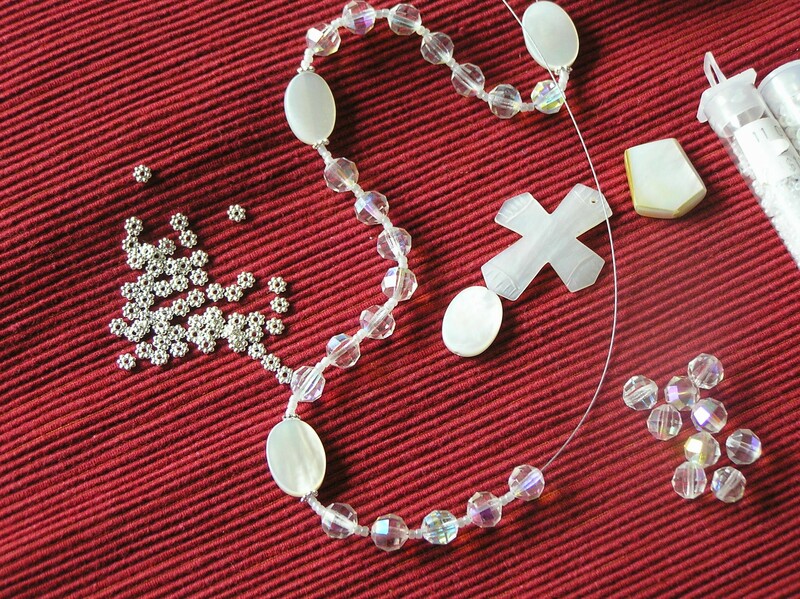 So, if you want to read about prayer beads, skip this post. We woke up this morning all excited and ready to go. A quick breakfast and the extended family assembled in the hotel lobby and off we went. 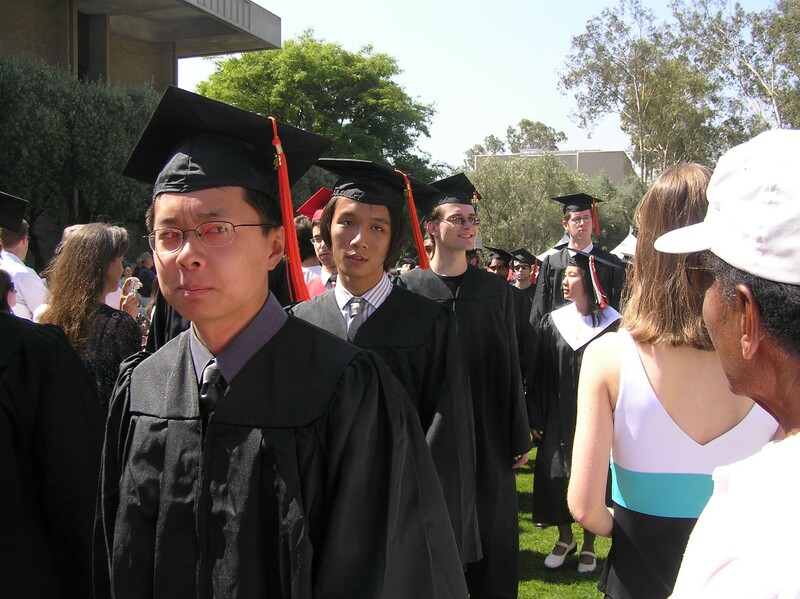 Even our younger son, Chris, who is always late, made it more or less on time – only 15 minutes behind schedule. Into the van and off we went. 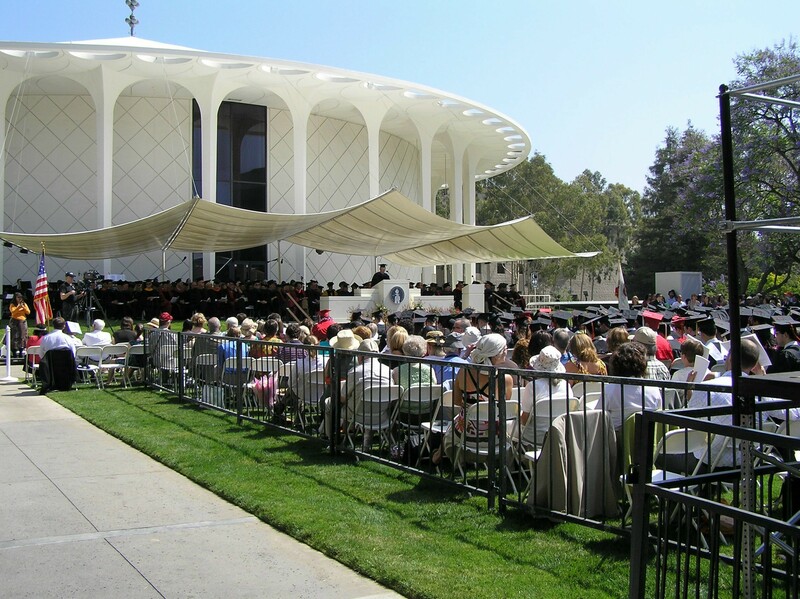 The California Institute of Technology holds its commencement ceremonies on what is now known as Beekman Mall, but which my husband – class of old farts – remembers as the only slightly pretentiously named “Court of Man.” It’s a lawn. That’s what it is. A lawn that spreads between four big buildings and was, on this day, covered with hundreds or even a thousand or more white folding chairs. We – a party of 10 Ligockis and Petersons – found seats about halfway back on the right. The stage was far, the sun was hot, but we were so excited we didn’t notice – not really. People milled about, children ran around, cameras clicked. Then the music started. From the back of the lawn, the undergraduates processed in. For me, this was one of the highlights of the day. I had an aisle seat and every student – undergraduate, masters candidate and PhD, had to file past me. I got to look into the faces and the eyes of every kid taking this enormous step into the next part of their lives on this bright, sunny day. THIS was when I cried. And, as usual, no tissue. Shawn marched past. Here is his picture to prove it. After Shawn came Cecilia. See the ears on her hat? After all the students filed past, came a long line of faculty. Now this was really impressive. Some – actually many – of these folks have Nobel Prizes, Fields Medals and/or MacArthur Genius Awards. Some were wearing them around their necks. All I can say is I was wowed. I was moved. The brains walking by, you know? And in such a profusion of colors – scarlets, golds, oranges, blues – even hot pinks – the colors of the schools they received their degrees from. It was intimidating and inspiring at the same time. 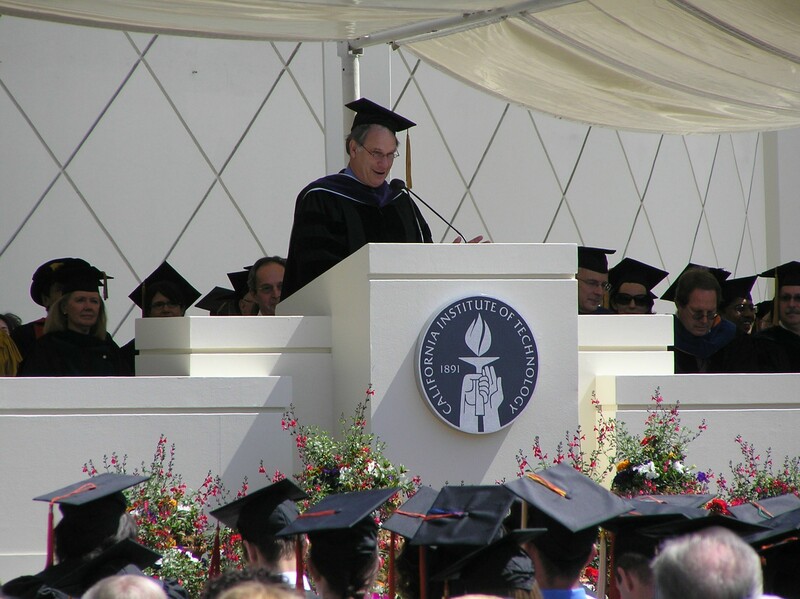 The commencement speaker was Robert Krulwich, one of my all-time favorite journalists. Imagine my luck – my kid graduates from one of the top technical schools in the world and I get to sit and hear a top journalist give them – and me – advice. And his advice was this – when you are asked by friends and relatives and other non-science junkies what you are working on, don’t launch into some long description of th technical aspects of your work that will only choke them with boredom and make them feel dumb. Instead, tell them a story. It is the power of story, Krulwich said, that captures the imagination, that sparks the desire to know more and that draws non-scientific people to the side of science. And then they started the long list of names as the kids walked across the stage. I got this great picture of Shawn. Gluttons for punishment can view the entire 126-minute commencement service at CalTech’s website. After Shawn crossed the stage, we all sat in the shade and had a generally fabulous time. When it was over – and no, they didn’t throw their caps. Much too smart for that, I guess – he joined us for pictures. While we were milling about taking pictures, this young man – who kinda resembled Shawn – came over to speak to Shawn. He was wearing a cap and gown and I assumed he was a buddy of Shawn’s, maybe a for mer roommate or a lab partner or something. Then Shawn introduced him – “This is my professor, Eric Winfree” and I about swallowed my tongue. Dr. Winfree is the MacArthur Genius Award winner that Shawn worked for last summer and for part of this year as a teaching assistant. His field is DNA logic. He looks about 12. I just couldn’t come up with a single intelligent thing to say, except “Hello, nice to meet you.” He did say Shawn was an exceptional young man. Wowowowowowowow. Wow. Then we had some fun pictures. 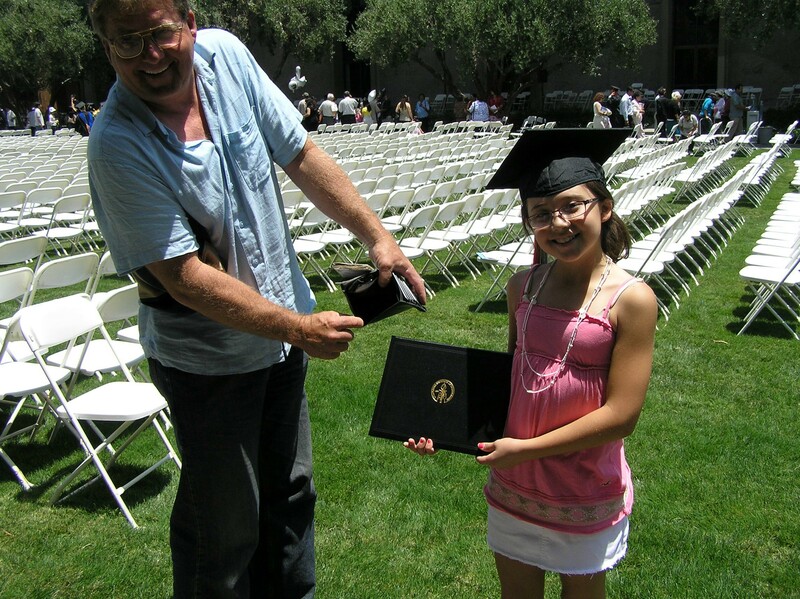 Here is one of Vanessa, Shawn and Chris’ 11-year-old cousin, and her dad, Rocky, preparing for what’s coming . . . SOON. We all walked to the Athenaeum for a post-commencement luncheon of a really good chicken salad before splitting up. Our dinner reservations were for 7:30 at The Parkway Grill. Now, this is where the day got even better – I didn’t think it could, but it did! Ten of us Ligockis and Petersons first sat in the lounge and had a celebratory drink – beer, wine and Cokes. 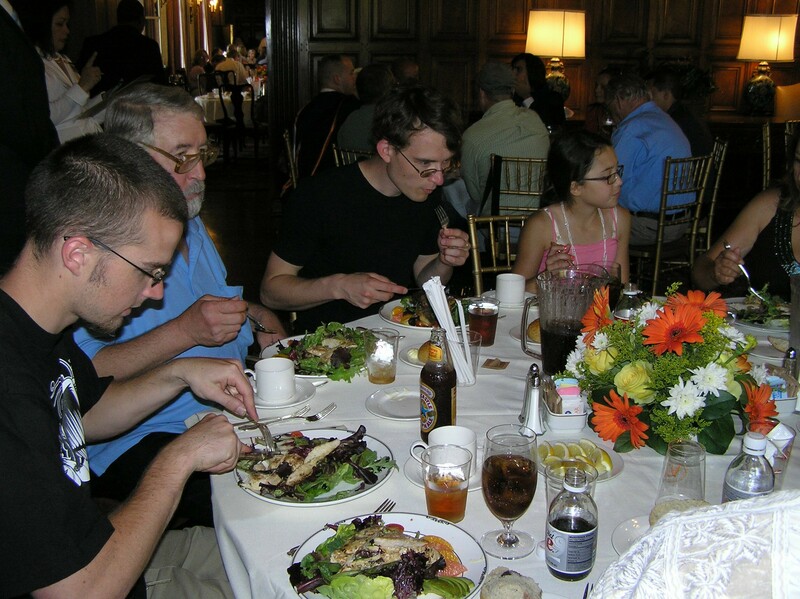 When we were seated – at a lovely table in the middle of restaurant next to a large flower arrangement, Shawn was placed at one head of the table and his uncle Rocky at the other. Somehow – and I swear this was serendipity – everyone sat exactly where they should have in order to have the maximum good time! I was smack between Shawn on my right and Chris on my left. Across the table were Shawn’s Uncle Mike, Aunt Donna and Aunt Leticia. His 11-year-old cousin Vanessa sat to Chris’ other side. And then it was like a dream – really and truly. We had Champagne (REAL Champagne) to toast the graduate. Over appetizers and entrees that all agreed were heaven (I think Uncle Dean’s word for his filet mignon was “orgasmic”) we drank wine and laughed and talked and ate for THREE HOURS. I cannot over exaggerate the deliciousness of the food nor the kindness and attention of the wait staff, from the sommelier to the waiter, Lance, to the busperson. To all the folks at Parkway, this was a magical, glorious evening and my family and I will always be grateful to you for one of the finest evenings of our lives. People, if you are ever in Pasadena, eat at the Parkway Grill. And then it was back to the hotel, where Terry and I sat up and talked about the day and the night for an hour. We agreed we are among the luckiest people in the world – lucky to have such a son and lucky to be able to fete him this way. I wish you all – ALL -could have been a part of this day. 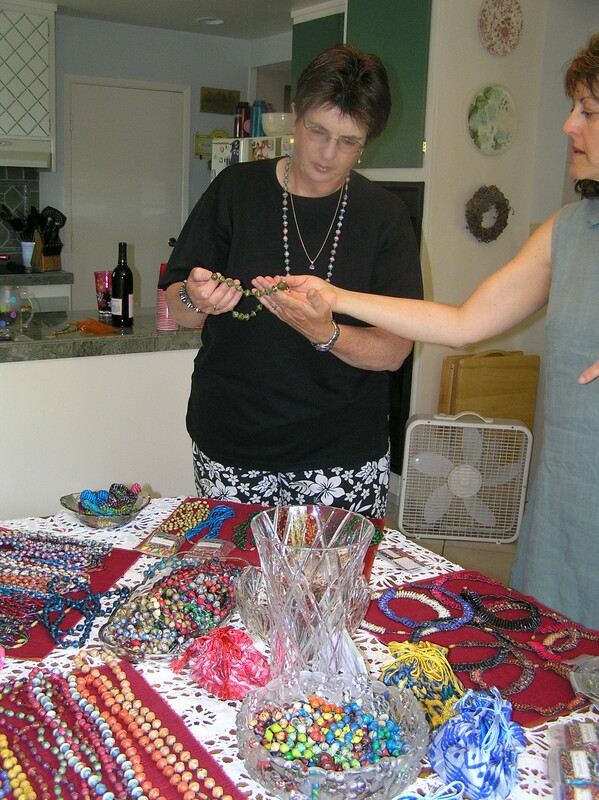 This post will depart from the usual subject of this blog – prayer beads – and chronicle the night before my eldest son’s graduation. So if you are friends and family, keep reading. If not, you’re welcome to read, but there ain’t nothin’ about prayer beads in here. 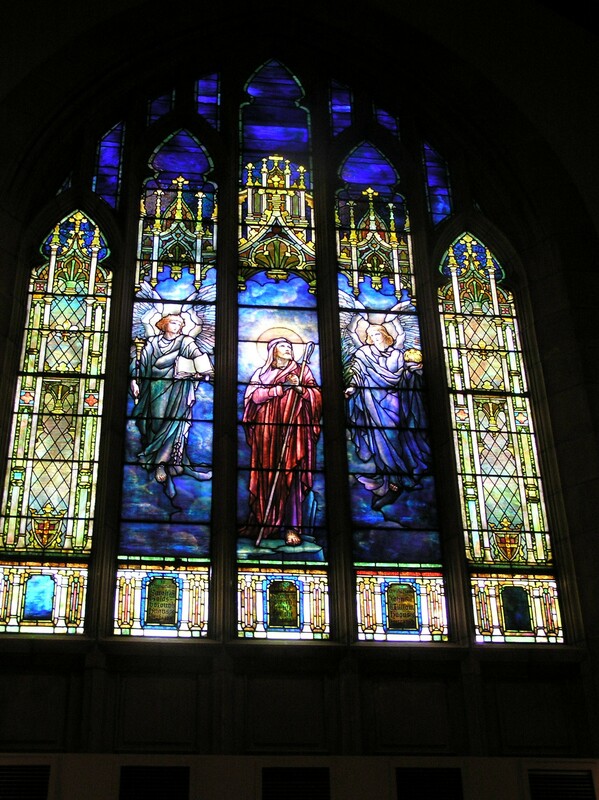 Tune in tomorrow night, as I have plans to use a set in a special chapel. But tonight is all about Shawn. 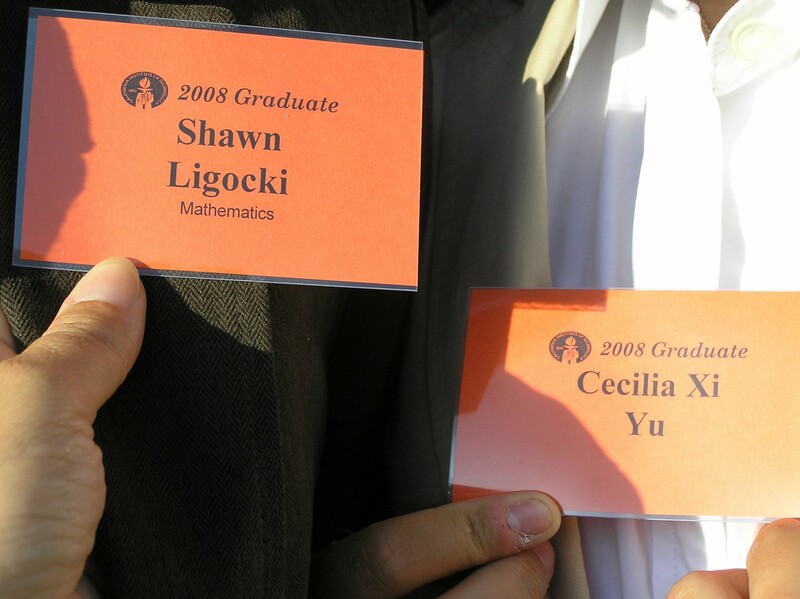 Shawn is 22 and tomorrow he graduates with a degree in mathematics from the California Institute of Technology – known to alumni and other insiders as CalTech. Time to brag – it is one of the top ten schools in te country and I thik at times it has been as high as 4 or 5 in the U.S. News and World Report rankings. 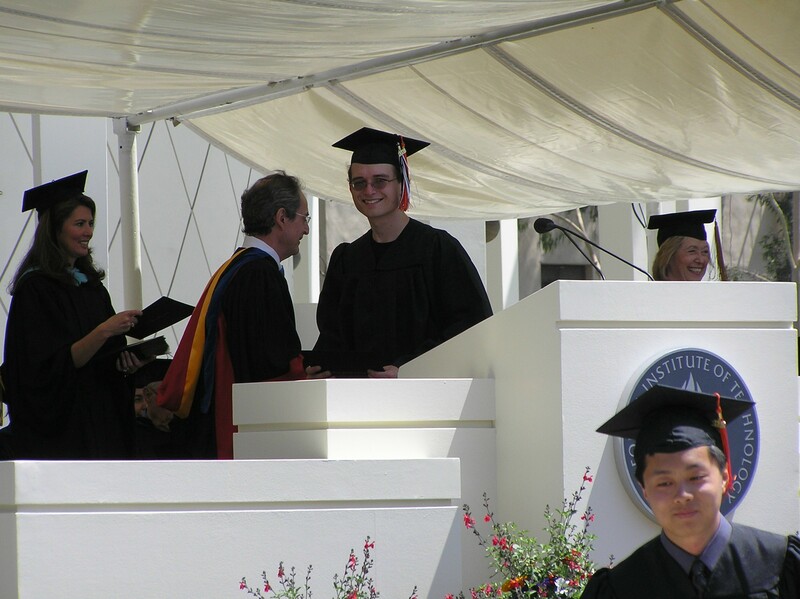 It is, in other words, a geek-o-rama and my son and his father – another CalTech grad – love it. I do, too, tho as only a mother whose undergraduate degree was in theater could. Time for full disclosure. Shawn is my stepson. 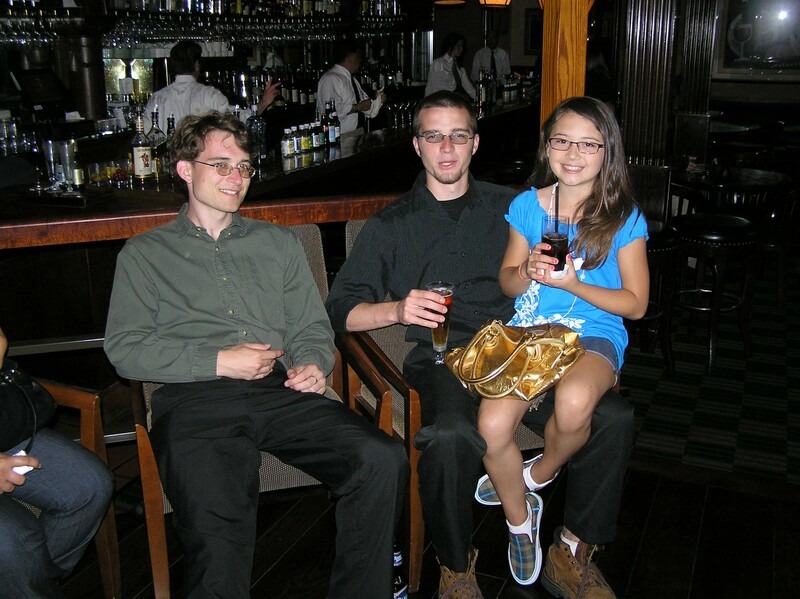 I inherited him and his younger brother, Chris, when I married their father 10 years ago. I could not love these boys more or be more proud of them both if I had given birth to them. But I feel it is right and good to honor their biological mother here. Her name was Mary and she died when Shawn was 9 and his brother was 7. 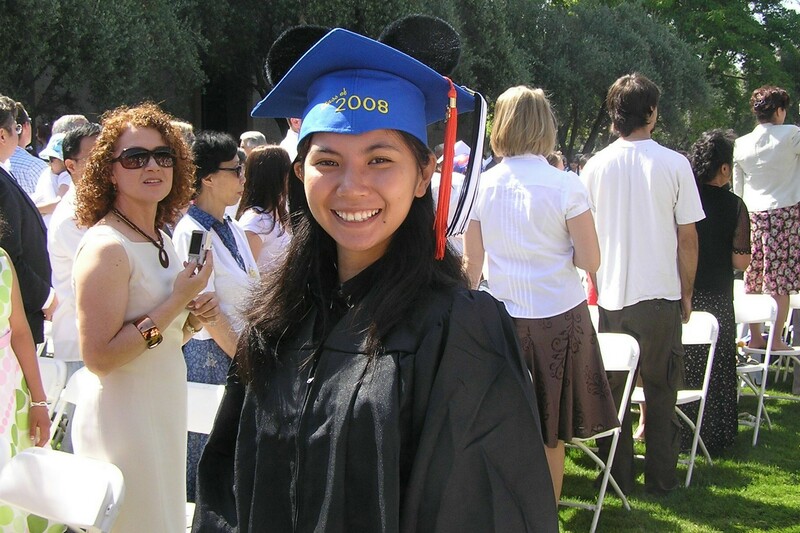 She was also a CalTech alumna and met the boys’ father here on their first or second day, during a freshman class trip to Catalina Island. That was a big day for Terry – he met his future wife and saw the Pacific Ocean for the first time. Today, walking along this campus’ leafy sidewalks and through its pillared collonades, I cannot help but think of Mary and know how proud she would be of Shawn, too. She cannot be here, but I can be here for her. And for Shawn. It is a duty and a joy to do so and I hope wherever Mary is she knows how fabulous this kid turned out, in large part because of who he came from. I hope she knows he is deeply loved and cherished. 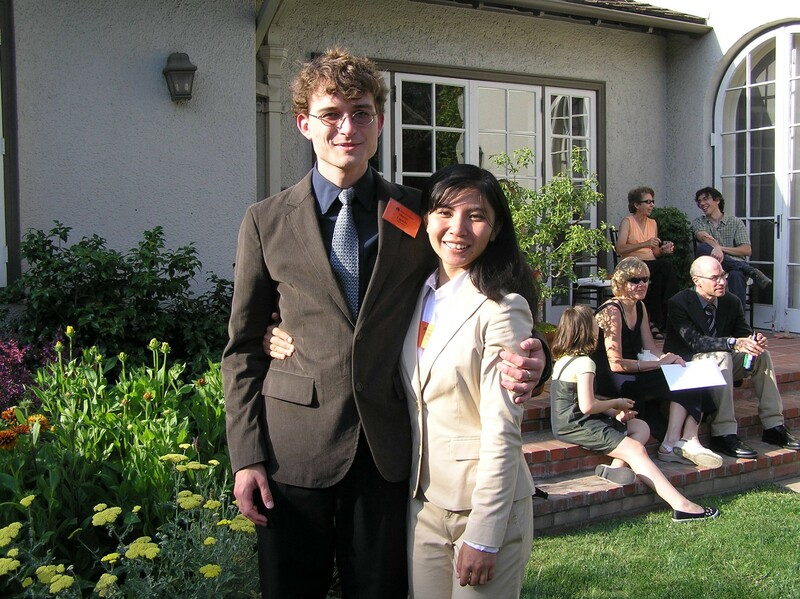 And, so, we celebrated Shawn’s graduation tonight with a reception at the President’s residence, where there was a jazz combo and lots of food and wine. The president himself, Jean-Lou Chameau, greeted us at the entrance, so you know this is small school! We were joined by his girlfriend, Cecelia, who will also graduate tomorrow with a dual degree in business and engineering. No slackers here. 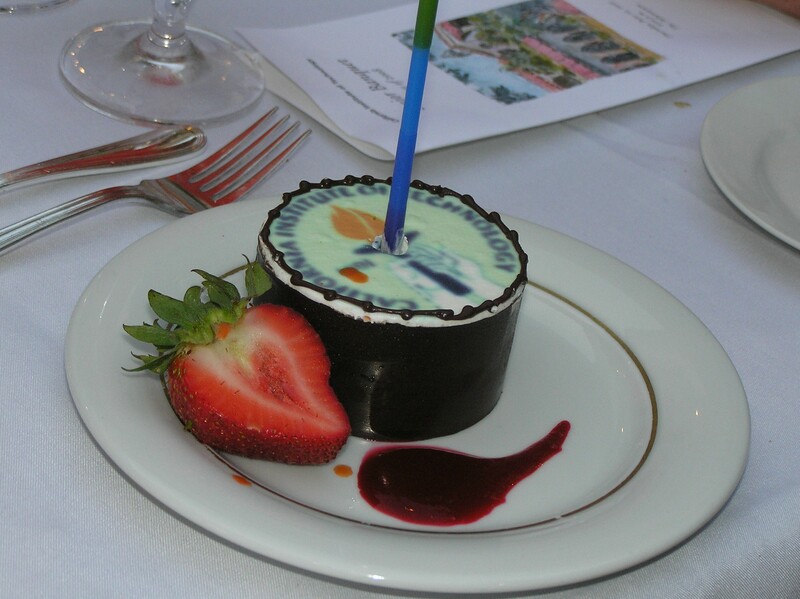 Then we walked over to the Athenaeum – a kind of faculty club – where about 700 of us sat under the stars and the twinkling lights and had a dinner of chicken and beef followed by a dessert of individual cakes glazed with the CalTech emblem. After dinner there were some lovely comments by the university’s president, Jean-Lou Chameau, and the dean of students, John Hall. 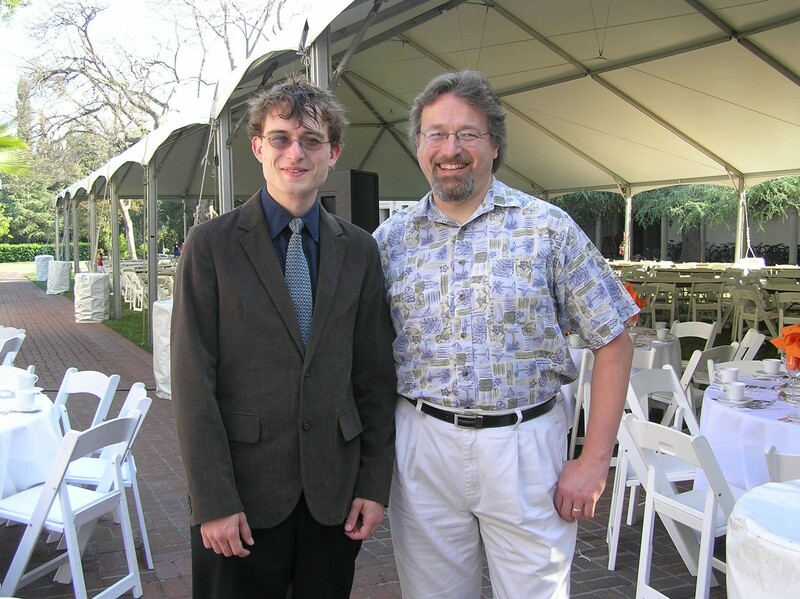 But the best speaker was Michael Brown, a professor of planetary astronomy here at CalTech. Know who this guy is? He’s the guy who single-handedly got Pluto kicked off the planet list. That guy. He was also named as Wired magazine’s ten sexiest geeks. I can’t weigh in on that because from where I was sitting I could not see him. But I could hear him. And what he said made me laugh and cringe at the same time. He told stories on himself about how he asked to teach geology to the class of 2008 without any background in the subject – and then totally failed to follow through with learning anything about it until after he was teaching it. He then said he hadn’t worked on this remarks tonight until minutes before the dinner. I am not doing his story justice – it was very funny – but how the heck did this guy convince us all to demote Pluto? we’ve given him to tools to do the best he can. Scary.